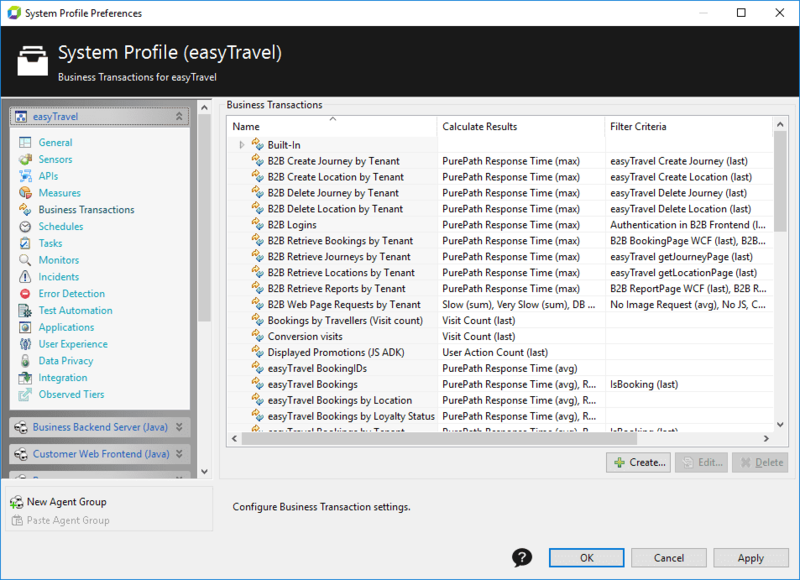 The Business Transactions item of System Profile Preferences dialog box allows you to view and manage a System Profile&apos;s Business Transactions (BTs), including creating new BTs and editing existing ones. See Business transaction configuration for more information on creating and editing BTs. A business transaction is a set of automated interactions between IT systems that execute a business task or business process. In AppMon, a business transaction is a categorization of PurePaths defined by filter or grouping parameters. When a PurePath matches those parameters, one or more evaluation metrics are calculated to create the result set of the business transaction. See Business Transactions to learn how to use business transactions. In the Business Transactions item, a disabled (gray) entry means the specific business transaction is not evaluated for the System Profile and does not produce results. Setting Business Transactions active or inactive helps reduce performance impact. Right-click to select or clear the active state.